Ya’ll think all the awesome events are over? Well, think again! May & June will be packed with epic parties & we’ve listed them down especially for our Festival Pass holders! This entry was posted in Events, Featured Events, PROMO, This Week's Hot Events, Uncategorized and tagged Chaos Manila, Close Up Forever Summer, edm, events, festival pass, fuse music festival, Game of Thrones, hodor, indiefest, ingrosso, jack daniels, Jacko Wacko, Palace Manila, Party, Partyphile, Partyphile App, partyphile festival pass, pjma, rave, sale, The Palace Pool Club. Bookmark the permalink. Kung Hei Fat Choi! This coming Chinese New Year, discover what your Chinese zodiac signs says about you in terms of how you will be partying this 2016 like a #LegitPartyphile! This entry was posted in Funny Stuff, Reposts, Uncategorized and tagged animals, chinese new year, edm, events, guestlist.ph, Party, Partyphile, rave, signs, zodiac. Bookmark the permalink. This entry was posted in Events, Featured Events, Music, Party Photos, This Week's Hot Events, Uncategorized and tagged Cebu, edm, events, Hyper Cebu, Hyper Wonderland, Hyper Wonderland Cebu, Party, Partyphile, rave, Sinulog, Sinulog2016, UBEC. Bookmark the permalink. Elektrifying music and beats from the hottest line up, fist pumping & nothing but show of love from the epic crowd. That is Elektromundo 2016 in City Times Square Cebu last night! This entry was posted in Events, Featured Events, Music, Party Photos, This Week's Hot Events, Uncategorized and tagged Cebu, edm, ELektromundo, ElektroMundo 2016, events, guestlist.ph, LIV, liv super club, Party, Partyphile, rave, Sinulog, Sinulog 2016. Bookmark the permalink. I’m sure you are all still hungover LifeDance 2016! It’s indeed one of the most spectacular events this Sinulog weekend. You gotta see this album & check out all the hot ladies & gents in Cebu captured through the lens of Jacob Casile Photography. This entry was posted in Events, Featured Events, Music, Party Photos, This Week's Hot Events, Uncategorized and tagged Cebu, events, guestlist.ph, Life Dance, Life Dance Cebu 2016, Party, Party Photos, Partyphile, photos, rave, Sinulog, Sinulog 2016. Bookmark the permalink. Parytphiles! Did you know that the world is celebrating World AIDS Day every first of December since the year 1998? Well, it’s a day dedicated for our friends who are strongly fighting HIV. It’s a day when people around the globe gather to show their support to raise money, awareness, and help in improving education about HIV and AIDS. This entry was posted in Music, Uncategorized and tagged Blog, events, Hydro Manila, Party, rave, Redvolution. Bookmark the permalink. It’s that time of the year again for a musical festival that’s all about enjoying our youth, getting close, and staying fresh. Closeup Forever Summer is even bigger and better this year with performances from local and international artists such as indie sibling-duo Angus and Julia Stone, one of the best and youngest DJs in the world — Martin Garrix, DJ Eva Shaw, and also Sinyma, Autotelic, DJ Nix Damn P with Motherbass, and BP Valenzuela. This is all gonna happen on May 16, 2015 at the Mall of Asia Concert Grounds from 2 PM onwards! With that, we listed down a list of people you’ll see on the ~twittersphere~ now that Closeup Forever Summer is just a few weeks away. This entry was posted in Events, Featured Events and tagged 2015, closeup, closeup forever summer, edm, events, Party, rave. Bookmark the permalink. This entry was posted in Events, Featured Events, Party Photos, Uncategorized and tagged events, Gold VIP Night, Imperial Ice Bar, Partyphile App. Bookmark the permalink. The Summer heat is unbearable and #LaBoracay2015 is just right around the corner. 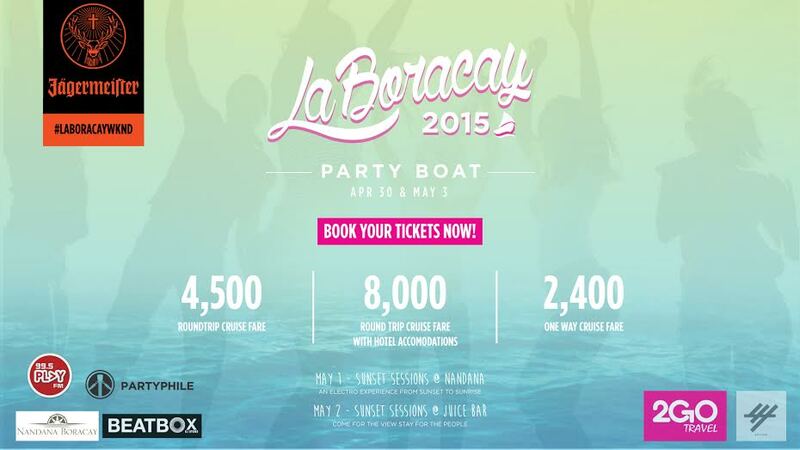 Find out how you can get to LaBoracay 2015 absolutely FREE here. We’re already in the middle of April and this Manila heat is unbearable AF. We don’t know about you but we’d rather be spending it chilling by the pool or even better, by the beach. Luckily, we only have to wait a few more weeks for that one event we look forward to the most every summer. It’s that one time of the year again when everyone just treats themselves for working their asses off at work or in school — We’re talking about the one, the only (drum roll please…) LaBoracay! Are you excited to experience LaBoracay 2015? Why not start a few days early! Experience the 2Go Party Boat this April 30 to May 1! This entry was posted in Events and tagged 2015, 2Go, edm, events, labor day, laboracay, laboracay 2015, Party, party boat, Partyphile, rave. Bookmark the permalink.